Once we’d settled into the cottage, we thought it rude not to take advantage of an almost unknown period of geographical stasis, so signed up for a series of part-time courses at the local college. After a bit of back-and-forth over which courses may or may not be running, we’ve ended up with Wednesday through Friday each week booked. The weather, however, seems to have other plans. It all started last Thursday afternoon, when darkening skies and decreasingly liquid precipitation suggested that hitting the supermarket – hard – would not be a bad plan. 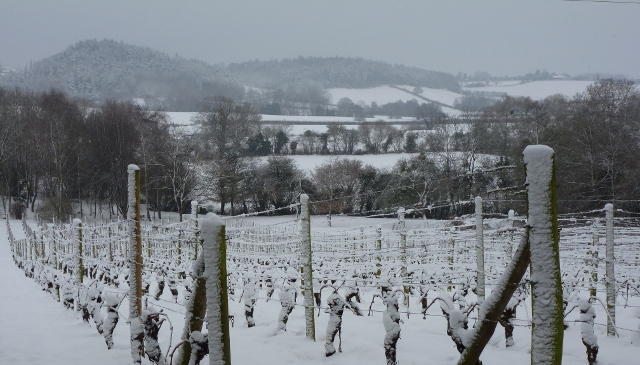 It was no great surprise when Friday’s dawn saw our little corner of Herefordshire buried, in apparent sympathy with much of the rest of the country, under a thick blanket of snow. A quick check on the college’s website showed that there was no point in even attempting to head out into the big wide world. They were closed. Hey-ho. Strike one-ninth of my wood carving course. As Friday turned into Saturday, plans for the weekend started to look less and less viable. First thing Sunday morning, I went off for a little wander up the lane, to see if there was any hope of vehicular escape. The decision wasn’t difficult – not without 4wd or winter tyres, no way. From the driveway here, the single-track lane climbs gently for about a quarter of a mile, before getting a chunk steeper at the junction. Since the lane’s only used by us, our landlords, and the farm a bit further down, there was enough traffic to cause the snow to become compressed and very icy, but not enough to clear it. Even had we got to and past the junction, the main lane out of the village (itself only 10 or 15 houses) looked to be in similar condition, with little hope of reaching tarmac for the thick end of another mile. Monday, though, brought slightly warmer temperatures – so we figured it was time to give it a try. Since the Peugeot’s clutch seems to have celebrated release from the lockup it was tucked away in during the trip by starting to slip badly at every opportunity, we’re still relying on the van. It fired up and emerged from its blanket easily, but seemed determined not to idle at all – as soon as my right foot let the throttle pedal close totally, it was as if the engine had just been switched off. Hmm. This could be fun. Out we bimbled, and headed up the lane with surprisingly little problem. The last bend before the junction, though, held an unexpected hazard – in the form of an articulated tanker truck, bringing feed to the farm’s cows… No choice, but a quarter of a mile of reversing back to our gate, interspersed with repeatedly restarting the van’s engine – the couple of passing places in the lane would have been borderline in width at the best of times. Once to the junction, though, the worst was passed – although the long-but-flat route into town seemed wiser than the steeper hills of the more direct alternative, as well as hitting the major (well, relatively – it’s got a number, even if it is a B and four digits) road more quickly. Even so, it was still probably three miles before we consistently put tyre to tarmac. Tuesday saw the college’s website announcing that they had re-opened! Woo! Just in time for Wednesday, and Ellie’s Creative Printmaking session, right? Umm, wrong. Another few inches last night saw the big red banner appear at the top of the website again. Will tomorrow see more of the same? Will it continue into the weekend? Watch this space. This entry was posted in Art & Culture stuff, By Country - UK, Personal stuff, Van stuff. Bookmark the permalink. I recently put winter tires on my Saab 9-5 and it likes to plow through a foot of snow. Scariest I have been in a car was in a rental VW Polo with summer tires in Tuscany with a few inches of snow on the roads. Not fun when you start sliding down a hill and you’re wondering if the car is going to stop before that sharp turn. So yes, I am strong believer of having the right tires for the right season. Is the VW camper your daily driver? I had winters on the c900 before we left, but they went with it when I sold the car. Winter tyres are slowly starting to become less of a radical and alien concept in the UK, but they’re still very much the exception – and, no, we don’t have a set for anything at the moment. The van is the daily driver again, by default, since it’s the only working and legal vehicle – the 205’s hors-de-combat at the mo. Only a clutch change required, and it’ll be back in service, but somehow that’s not a very appealing job at the mo. Can’t think why.